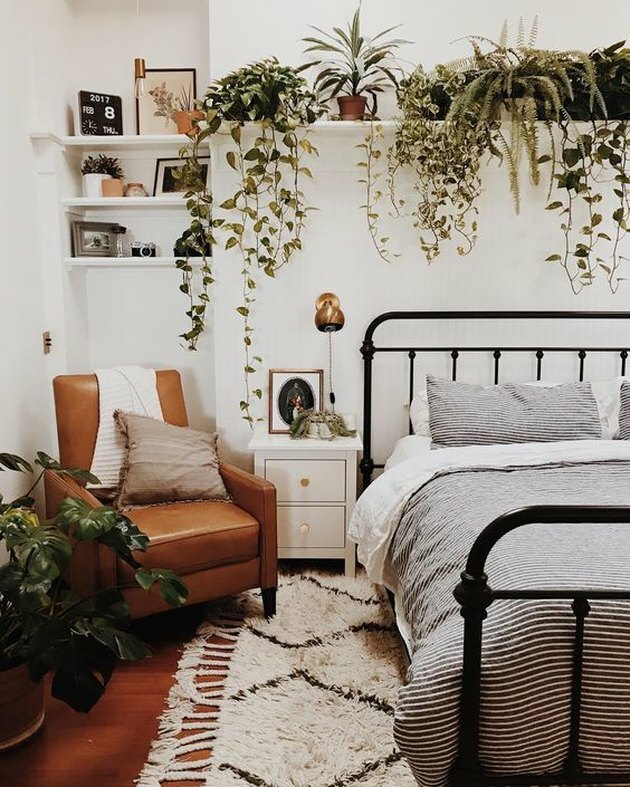 Q: How do you create a boho vibe in a small bedroom without over-cluttering? 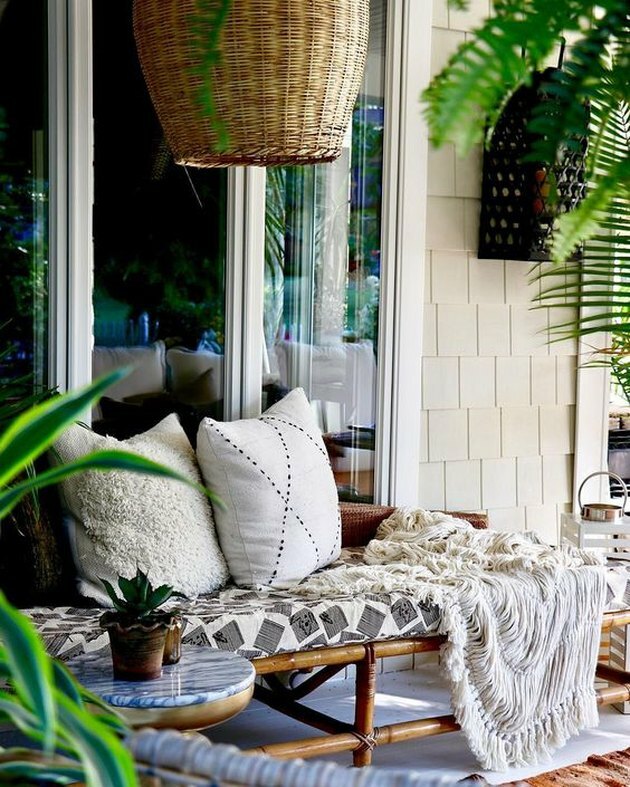 For the past few years boho style has remained a leading decor trend. The vibe is usually conveyed through a variety of bright colors, rich textures, staggered layers, and earthy materials. However, in a small space, this combination can quickly crowd a room both visually and spatially. But even in a tiny bedroom the boho look can still be easily attained without overwhelming. Design and decor should be different and enjoyable for everyone. Perhaps some of these tips will work for you, perhaps some won't, but here are a few practices that've worked repeatedly for me during my years of styling small spaces and crafting compact bohemian beauty. Choose a calm and cohesive color palette. While part of the joy in embracing boho is welcoming a vibrant array of color, it often helps to stick to a cohesive palette when working within petite quarters. Go bold within a dedicated spectrum, and you're more likely to end up with a space that's both interesting and airy. One of my favorite examples of this is the home of Baltimore-based artist and creator Hilton Carter. He mixes every shade of green imaginable with warm leathers, earthy woods, and stone-hued grays. Don't be afraid to embrace texture. Bring on the texture! But try to keep lines and shapes in mind. For example, if your throw boasts a chunky Moroccan diamond pattern, perhaps consider continuing variations on that pattern throughout your other accessories, such as your rugs and pots. Deeper weaves and ample fringe or tassels create a cozy feeling, but they can overrun a tiny bedroom. Explore texture within textiles, paint, and carvings, and limit the number of decorative accents along their perimeters. One of my favorite examples of this is the little outdoor daybed by Jennifer from FleaMarketFab. Over the years, I've realized that one of the easiest ways to clutter tight square-footage is to fill it with numerous smaller objects. Oftentimes it's more suitable to install one large piece of furniture or decor in lieu of grouping several smaller items in the same spot. A carefully selected plant with branches or leaves at staggered heights can breathe boho life into a space just as well as, say, four smaller plants that might cramp an accent table. Also, don't limit your decorative layering to just eye level and below. You can keep surfaces clear by hanging decor from the ceiling instead. 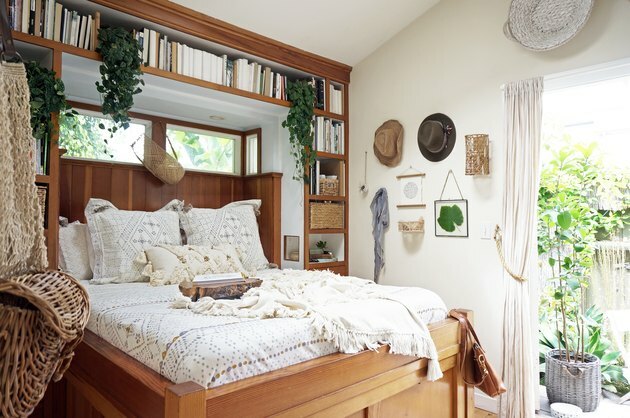 One of my favorite examples of going vertical is Katie's bedroom from BranchAbode. 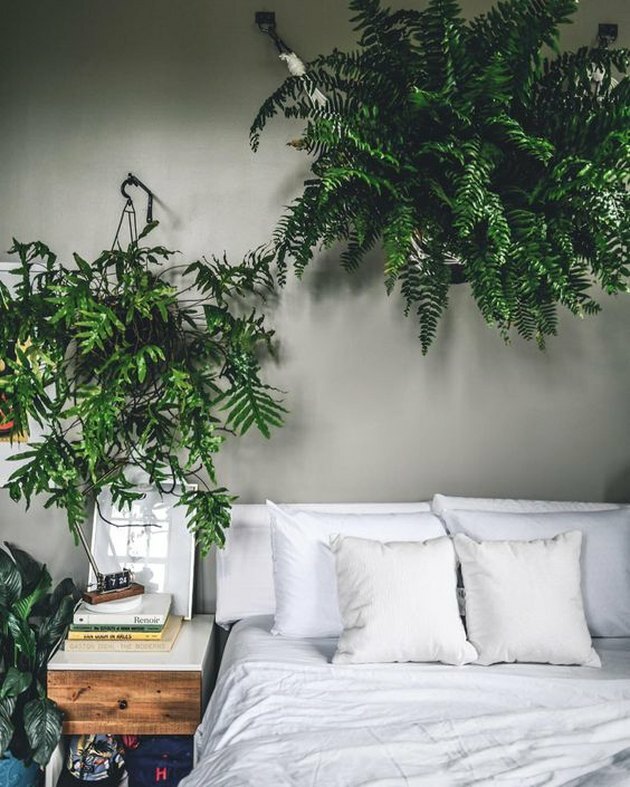 Organic materials sing to the free-spirited nature of bohemian decor, and they're also more sustainable and healthier for our planet than their plastic or manufactured counterparts. They mix-and-match well, and their open weave construction is ideal for a small space, allowing light and air to pass through. 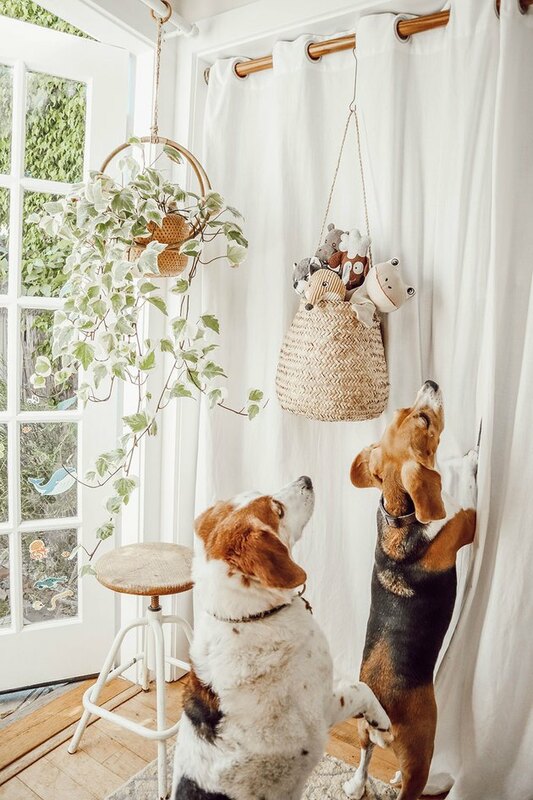 Instead of buying a new "boho" basket, try repurposing a vintage item (made from natural materials) to serve a utilitarian purpose while also operating as decor. 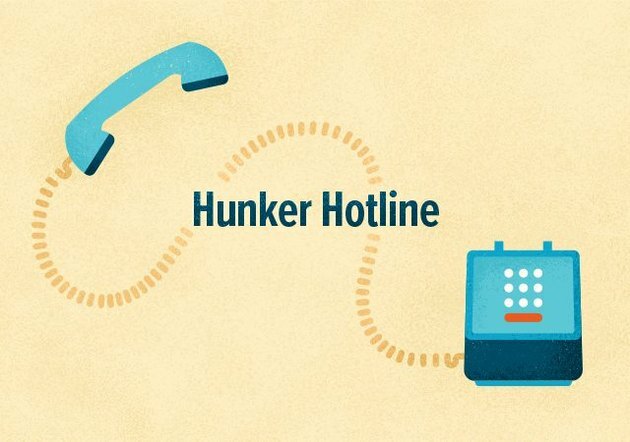 This keeps your number of belongings in check, ensures that they're functional (or, hopefully, multi-functional! ), and adds to the overall style of your bedroom. Try suspending a straw basket to corral miscellaneous smaller items. We suspended ours by hooks on our bedroom closet grommets. 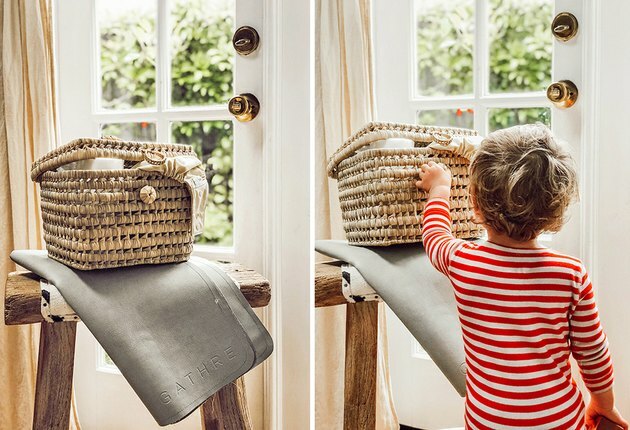 Instead of a standard (plastic) diaper caddy or storage container, use a handmade basket to store your little one's diapers or other miscellaneous items. Vintage picnic baskets are a great way to store files (instead of metal or plastic file cabinets) in the bedroom and "office."